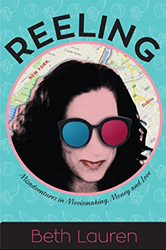 Reeling: Misadventures in Moviemaking, Money and Love offers hope for healing for sexual assault survivors who often hide in the shadows, afraid to share their stories. Ms. Lauren and the host, Renee Powers, tackle the themes she explores in her memoir, including PTSD; surviving sexual assault; what it means to be a feminist and how being a feminist informs her writing and her life choices. This debut memoir, which will soon be published by Boulevard Books, offers a glimpse into how the #MeToo movement has given survivors, who had not previously shared their experiences, the courage to candidly tell their stories. With her unique blend of wit and unflinching honesty, Ms. Lauren takes the reader on two different but equally compelling journeys-one the riveting truth of the matter, as Beth seeks justice and pursues healing for her mind, body and soul; the other an imaginary path, as Beth channels her screenwriter's eye into a cinematic alternative history. This innovative hybrid memoir-screenplay is a romance any lovelorn woman or man can relate to, a tragedy any survivor can draw inspiration from; and a comedy with laughs for any reader on every page. “The things I wanted to be, the so-called happy ending, didn’t work out as I had hoped at the time, but I’m better for it.” said Ms. Lauren said.